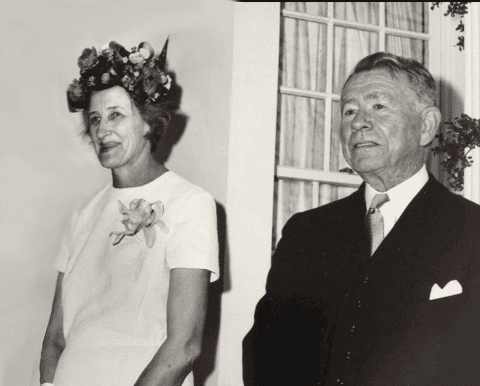 Writer and VCCA Fellow Mary D. Edwards has funded an endowed fellowship in honor of her parents, Sarah Stanley Gordon Edwards and Archibald Cason Edwards.Sarah Stanley Gordon Edwards was a professor of biology at the University of Central Oklahoma. Archibald Cason Edwards, a Greek and Latin Major at Harvard, was a businessman who published stories in Prairie Schooner. Mary established the fellowship to fund an annual two-week residency for women painters age thirty or more, with a preference to be given to Native American painters. 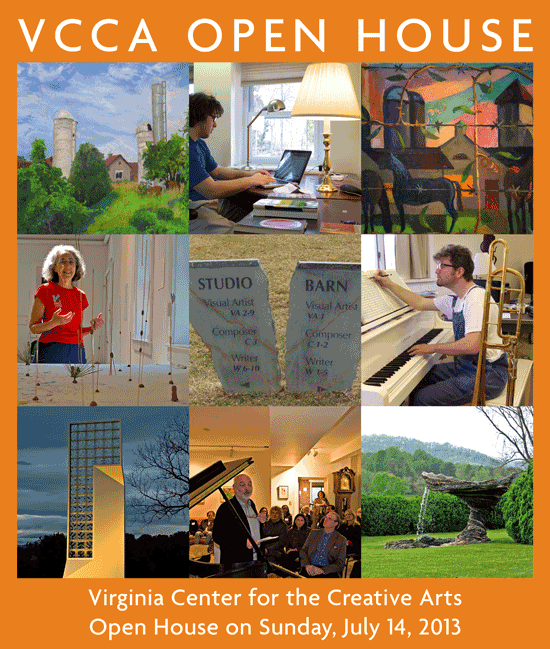 As some of you already know, the VCCA website is down due to technical problems. We are working on them, and will have the site up and running as soon as possible. 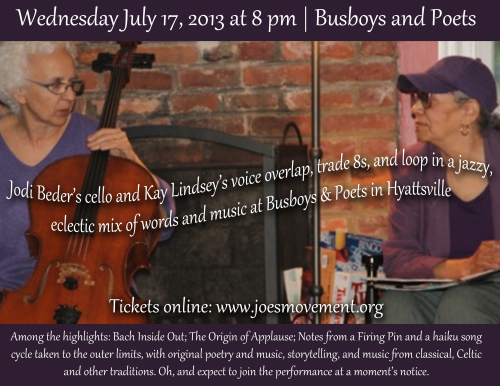 "Jodi Beder's cello and Kay Lindsey's voice overlap, trade 8's, and loop in a jazzy, electric mix of words and music at Busboys and Poets in Hyattsville, Maryland. Among the highlights: Bach Inside Out; The Origins of Applause; Notes from a Firing Pin and a haiku song cycle taken to the outer limits with original poetry and music, storytelling and music from classical celtic and other traditions." Sandy Hausman, Charlottesville Bureau Chief for WVTF Radio IQ, did a beautiful story on the multi-media arts installation Bright Shiny Me, which was featured at The Commission on June 1. Aside from interviews with the creators of Bright Shiny Me, visual artist Maja Spasova (London and Berlin) and composer Luis Hilario Arévalo (Mexico City), Sandy interviewed several guests who had glowing reflections about Bright Shiny Me. Guests strolling to the Bright Shiny Me installation at VCCA's The Commission on June 1. VCCA Open House on Bastille Day! TOP ROW: “VCCA Morning” Studio Barn by Shoshanna Ahart, visual artist, Germany; Joshua Gottlieb-Miller, writer, Maryland (photo by Bernard Handzel, photographer, New York); VCCA studio barn by Brett Gamache, New Hampshire. MIDDLE ROW: Joan Weber, visual artist, New York (photo by Medford Taylor, photographer, Virginia); VCCA Studio Barn sign (photo by Bernard Handzel); J. Walter Hawkes, composer, New York (photo by Bernard Handzel). 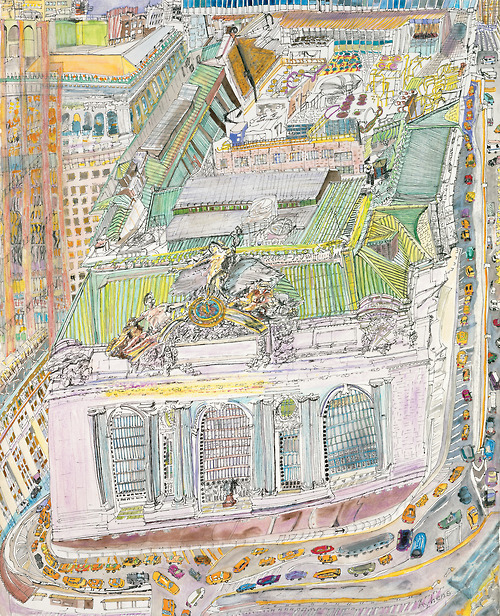 You can still catch Olive Ayhens' work at the ONTIME / Grand Central at 100 exhibition. The posters are sold out, but if you're interested, contact her.